But no other theory can explain so much. Continental drift is without a cause or a physical theory. It has never been applied to any but the last part of geological time. In 'Geophysics and Continental Growth', American Scientist (1959), 47, 23. Even more difficult to explain, than the breaking-up of a single mass into fragments, and the drifting apart of these blocks to form the foundations of the present-day continents, is the explanation of the original production of the single mass, or PANGAEA, by the concentration of the former holosphere of granitic sial into a hemisphere of compressed and crushed gneisses and schists. Creep and the effects of compression, due to shrinking or other causes, have been appealed to but this is hardly a satisfactory explanation. The earth could no more shrug itself out of its outer rock-shell unaided, than an animal could shrug itself out of its hide, or a man wriggle out of his skin, or even out of his closely buttoned coat, without assistance either of his own hands or those of others. The Rhythm of Ages (1940), 9-10. In Ireland, there are the same fossils, the same shells and the same sea bodies, as appear in America, and some of them are found in no other part of Europe. 'Preuves de la Théorie de la Terre', Histoire Naturelle, Generale et Particulière, Avec la Description du Cabinet du Roi (1749), Vol. I, 606; Natural History: Theory of the Earth (1749), Vol. I, Trans. W. Smellie (1785), 507. In the whole of geophysics there is probably hardly another law of such clarity and reliability as this—that there are two preferential levels for the world’s surface which occur in alternation side by side and are represented by the continents and the ocean floors, respectively. It is therefore very surprising that scarcely anyone has tried to explain this law. In The Origins of Continents and Oceans (4th ed. 1929), trans. John Biram (1966), 37. 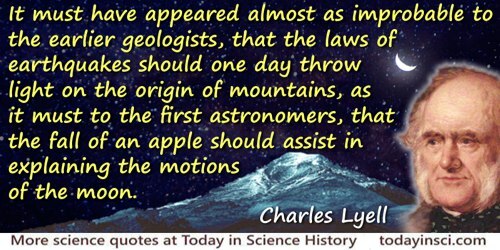 It must have appeared almost as improbable to the earlier geologists, that the laws of earthquakes should one day throw light on the origin of mountains, as it must to the first astronomers, that the fall of an apple should assist in explaining the motions of the moon. Principles of Geology(1830-3), Vol. 3, 5. 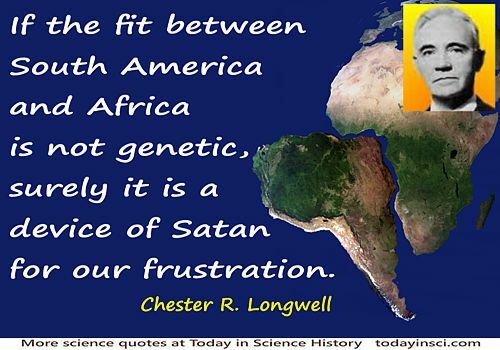 South America must have lain alongside Africa and formed a unified block which was split in two in the Cretaceous; the two parts must then have become increasingly separated over a period of millions of years like pieces of a cracked ice floe in water. In The Origins of Continents and Oceans (4th ed. 1929), trans. John Biram (1966), 17. The forces which displace continents are the same as those which produce great fold-mountain ranges. Continental drift, faults and compressions, earthquakes, volcanicity, transgression cycles and polar wandering are undoubtedly connected causally on a grand scale. Their common intensification in certain periods of the earth’s history shows this to be true. However, what is cause and what effect, only the future will unveil. In The Origins of Continents and Oceans (4th ed. 1929), trans. John Biram (1966), 179. The globe of this earth … [is] … not just a machine but also a organised body as it has a regenerative power. 'Theory of the Earth', Transactions of the Royal Society of Edinburgh (1788), as quoted in Keith S. Thomson, 'Vestiges of James Hutton', American Scientist (May-Jun 2001), 89, No. 3, 213. The Newton of drift theory has not yet appeared. His absence need cause no anxiety; the theory is still young and still often treated with suspicion. In the long run, one cannot blame a theoretician for hesitating to spend time and trouble on explaining a law about whose validity no unanimity prevails. In The Origins of Continents and Oceans (4th ed. 1929), trans. John Biram (1966), 167. The transition from sea-floor spreading to plate tectonics is largely a change of emphasis. Sea-floor spreading is a view about the method of production of new oceans floor on the ridge axis. The magnetic lineations give the history of this production back into the late Mesozoic and illuminate the history of the new aseismic parts of the ocean floor. This naturally directed attention to the relation of the sea-floor to the continents. There are two approaches: in the first, one looks back in time to earlier arrangements of the continents; in the second, one considers the current problem of the disposal of the rapidly growing sea floor. 'The Emergence of Plate Tectonics: A Personal View', Annual Review of Earth and Planetary Sciences, 1975, 3, 20. Therefore, these [geotectonic] models cannot be expected to assume that the deeper parts of the earth’s crust were put together and built in a simpler way. The myth about the increasing simplicity with depth results from a general pre-scientific trend according to which the unknown or little known has to be considered simpler than the known. Many examples of this myth occur in the history of geology as, for instance, the development of views on the nature of the seafloor from the past to the present. In 'Stockwerktektonik und Madelle van Esteinsdifferentiation', in Geotektonisches Symposium zu Ehren von Hans Stille, als Festschrift zur Vollendung seines 80, Lebensjahres (1956), 17, trans. Albert V. and Marguerite Carozzi. Though the theories of plate tectonics now provide us with a modus operandi, they still seem to me to be a periodic phenomenon. Nothing is world-wide, but everything is episodic. 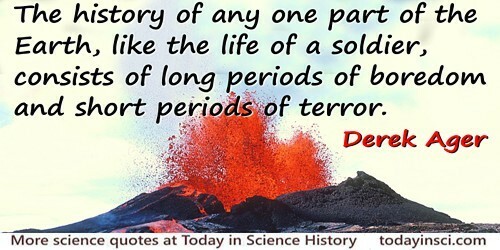 In other words, the history of any one part of the earth, like the life of a soldier, consists of long periods of boredom and short periods of terror. In The Nature of the Stratigraphical Record (1973), 100. With such wisdom has nature ordered things in the economy of this world, that the destruction of one continent is not brought about without the renovation of the earth in the production of another. Theory of the Earth, with Proofs and Illustrations, Vol. 1 (1795), 183.